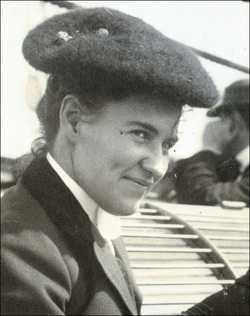 Willa Cather's life spanned two centuries, and she witness a tremendous change in the American culture and society. Cather once wrote that for her the world broke in two in 1922. She never fully explained what she meant, but from her writing we can infer that she may have meant that the old world she had cherished - the world of the frontier where men and women struggled for survival on the Great Plains and all of the old fashioned values that struggle inspired - was being replaced by the new era that was dominated by World War I and the Jazz Age. 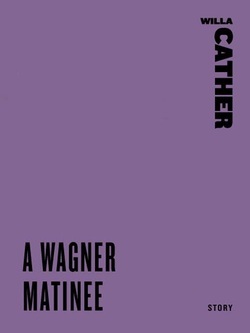 Commentary on "A Wagner Matinee"
Willa Cather–A Wagner Matinee The opportunity to cover a friend’s class led me to read “A Wagner Matinee,” a Willa Cather story I hadn’t previously known beyond its title. In the story, the narrator hosts his aunt, a sort of refugee-for-love who had quit Boston for the wilds of Nebraska a quarter century earlier. There’s not much story in the story. The nephew takes the aunt to a concert–the Wagner matinee–where she is enraptured by the music, an experience that she hasn’t enjoyed since her departure from Boston all those years earlier. I understood. For her, just outside the door of the concert hall, lay the black pond with the cattle- tracked bluffs; the tall, unpainted house, with weather-curled boards; naked as a tower, the crook-backed ash seedlings where the dishcloths hung to dry; the gaunt, molting turkeys picking up refuse about the kitchen door. Knowing Cather’s other work, I don’t believe we read this to indicate that she doesn’t want to return to Nebraska and her husband. The final section of My Ántonia presents a character similar to Aunt Georgiana, a woman of some grace, aged and worn by the demands of married life on the frontier. Unlike Ántonia, Georgiana does not support a long list of offspring, but like her, she has sacrificed something very real to make a life homesteading the prairie. Does she indicate a desire to throw all of that away? No, but she does recognize the life that had been, that might have been. I think here of the parables of the Kingdom of God that Christ offers in the Gospels. Consider especially the parable of the pearl of great price, Matthew 13:45-46. Does the pearl merchant decide that everything he owns is utterly worthless compared to this great pearl? No. He recognizes the relative values of the things sold and the thing bought. Aunt Georgiana, unencumbered by children, might well have told Uncle Howard to keep the farm and Nebraska for himself. Instead, she will return to Nebraska, not because she is an afflicted, oppressed woman in a male-dominated society. There’s nothing to suggest such a reading. Instead, she is a woman who has chosen a path, recognizing that the choice of one path closes off another one forever. This is the way of life. I think it is no coincidence that Clark takes his aunt to a Wagner matinee. Wagner’s operas abound with the sense of loss that accompanies a life spent pursuing things worth pursuing. Tristan and Isolde come to an unpleasant end, but they do so with eyes open and a willingness to follow the same course again. The “Prize Song,” which brings Aunt Georgiana to tears, speaks to the value of love. Won’t forget, can’t regret, what I did for love. Posted in American Literature, Modernism. Tagged with short stories, Willa Cather.